Is there any more romantic love story than that of the wilful Catherine Earnshaw and the charismatic, tortured orphan, Heathcliff? Even the blockbuster Twilight refers to it again and again, piquing the interest of a new generation drawing longtime fans back to this Victorian masterpiece. 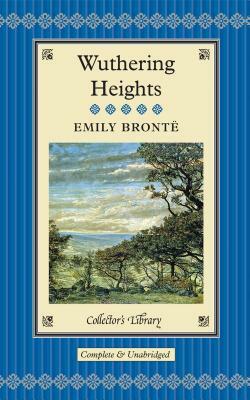 When Catherine rejects her childhood love in favor of an upper-class marriage, Heathcliff develops an all-consuming and all-destructive lust for revenge. Emily Brontë’s tale of hauntings, passion, and greed on the English moors remains unsurpassed in its depiction of the dark side of love. The world's greatest works of literature are now available in these beautiful keepsake volumes. Bound in real cloth, and featuring gilt edges and ribbon markers, these beautifully produced books are a wonderful way to build a handsome library of classic literature. These are the essential novels that belong in every home. They'll transport readers to imaginary worlds and provide excitement, entertainment, and enlightenment for years to come. All of these novels feature attractive illustrations and have an unequalled period feel that will grace the library, the bedside table or bureau.